Since 1979 I have watched you race, you raced like nobody I had ever seen before. You had a determination like no other, a desire, a yearning, you believed in yourself and you had the will to be the best at what you were doing. You will never know .... you were so much more. Over the years I realized that you were my hero, somebody that I could look up to. Somebody said today that you were like Superman, when I heard that I kind of smiled and realized that you were, in a sense, that Super Hero. Dale just about everybody can tell you that songs say a lot for me, here are just a couple that I'd like to dedicate to you. And Dale you did fly, higher than anyone ever imagined you would. Dale, this second song reminds me of yesterday's race, you know, when you were blocking everybody, keeping them away from Michael Waltrip and Dale Jr., it's what parenting is all about, standing back and letting our children shine ..... the words pretty much sum it all up ....... I don't think I ever told you that you were my hero either, but you are and you will always be my hero, no matter where you are. 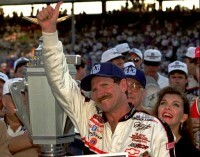 Mr. Earnhardt you were so much to so many people, I didn't realize that until today. I can't imagine what the races will be like without you. I honestly never thought the day would come when you were not there. What happened yesterday made me realize that someone can be taken in an instant, you are never promised tomorrow, you are never even promised the next second and knowing that has made me think that I should take advantage of every second that I'm given ........ to let the people that are dearest to me know how much they mean to me. Dale, I don't want to say goodbye, so I won't. I'll just simply say .......... "until we meet again". Leave knowing that you had a great impact on so many lives and that you are leaving behind a wonderful legacy for people to carry on and live up to. We'll all miss you, that goes without saying, you cannot be replaced by any means, and in our hearts and minds you will live on, forever. Race day will never be quite the same. Thank you for being you ......... we wouldn't have wanted you any other way. Dale .......... it's time to spread your wings and fly away, we'll all be okay so don't worry. Your fans will never forget you and we'll always love you.